Although the small, spindly trees now obstruct vision only minimally, some fear that, as they grow, they will create dangerous "blind spots" to traffic leaving businesses on Park Plaza Drive. Early this year the New Albany City Beautification Committee ordered 150 Pin Oak trees from a nursery in Tennessee. 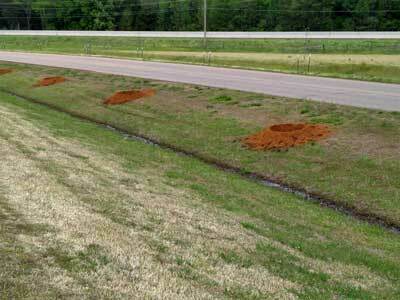 The intent was to plant them on both sides of Bankhead Street between the Tallahatchie River and Highway 30. Members of the Beautification Committee are appointed by the Board of Aldermen and include one At-Large member and one member from each of the city’s four Wards. They are not compensated for their service. The committee receives an annual appropriation from the aldermen, and is authorized to use it for such things as planting flowers planting trees and shrubs, etc. in public places. As happened here, the Tennessee nursery received unusually heavy spring rain and was unable to transplant the trees to containers and ship them until well past the normal time for tree planting. Holes dug for trees along Park Plaza Dr. The trees did not arrive in New Albany until early April. The project then hit a second major snag: the Mississippi Department of Transportation (MDOT) and New Albany Lights Gas and Water (NALGW) did not want the trees planted along Bankhead Street. NALGW feared the growing pin oaks would interfere with power lines. The Beautification Committee had to scramble to plant the trees somewhere so they could survive the hot weather. Sam Creekmore, IV, a landscape architect, serves as the At-Large member of the Beautification Committee. He knew that the trees would likely die if not planted soon. The problem was discussed at the Beautification Committee’s monthly meeting on April 9th. Creekmore held consultations by telephone with city officials and Beautification Committee members. Ten days later, Monday, April 23rd, the first of the Pin Oaks was planted on Park Plaza Drive. The planting was finished Tuesday, May 1. That same Tuesday evening, during the regular monthly meeting of the Board of Aldermen, Second Ward Alderman Johnny Anderson said he had received complaints about the trees planted on Park Plaza Drive. Alderman Anderson said he knew nothing about the trees along Park Plaza Drive until they were planted, and that the board had never authorized them to be planted there. Alderman-at-Large Keith Conlee and Fourth Ward Alderman Will Tucker said they knew nothing in advance about the trees being planted along Park Plaza Drive. The April 13th Beautification Committee minutes were not emailed to Conlee and Tucker. First Ward Alderwoman Livingston, the board’s liason with the Beautification Committee, also said during the May 1 board meeting that she knew nothing about the trees being planted on Park Plaza Drive. Several objections to the location were expressed during the meeting, including that the trees would interfere with the traffic view and safety of drivers emerging from the many businesses on the west side of Park Plaza Drive. Others said the trees were planted too close to the road and would damage the pavement. Mayor Tim Kent told NAnewsweb.com Monday that he believed some of the trees would be moved when cooler autumn weather arrives, but that they could not be moved now because they would not survive. NAnewsweb.com measured the height of some of the trees along Park Plaza Drive earlier this week. The ones checked ranged from 8 to 10 feet in height, and are planted 11-12 feet from the edge of the pavement. Besides At-Large member Sam Creekmore, other members of the New Albany Beautification Committee are: Jean Ashcraft, Ward One; Sandy Shaddinger, Ward Two; Jolyn Cooke, Ward Three; and Jane Ford, Ward Four. One bad act in Columbus, GA turns into two good news stories. Only in New Albany would some people complain about an avenue of trees that provide shade, oxygen and great beauty. Line of sight concerns? On that straight stretch of road? Really?? Wow!! I guess they don’t subscribe to Arbor Day being a celebratory event. Some people will complain about any and everything it seems. Plant more trees would be my thought. I think they will be beautiful! My first thought was that it would one day look like a southern allee’! I love the idea but my husband & I both think they r to close together & to close to the road. U have to think 20 yrs from now. It will b a mess if they r not fixed. They will b growing in to each other & completly covering the road from both sides.